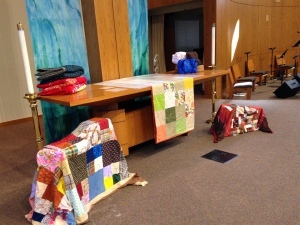 Sheridan Lutheran Church has been actively supporting the mission and outreach of Lutheran World Relief for many years by collecting, assembling and sending quilts, kits and soap to Lutheran World Relief to be distributed as needed. In 2014, Sheridan was able to provide more than 100 quilts, 114 school kits, 38 personal kits and 10 baby kits. For nearly 70 years, Lutheran World Relief has been putting faith into action by responding to the needs of people throughout the world. Help is provided to victims of disasters such as earthquakes, floods, famine and war. In 2012, nearly 15 million dollars worth of quilts and kits were distributed to more than 720,000 people in 23 countries. Lutheran World Relief also works to provide clean water, prevent malaria and educate people to learn a trade and improve agricultural practices. We know from various first-hand reports that Lutheran World Relief donations reach the people in need. Quilts not only provide warmth but are used as room dividers, shelter and a way to carry possessions. Baby Care Kits are often the only clothing for infants in refugee camps and orphanages. School Kits give children an opportunity to become educated even in times of disaster. Personal Care Kits given to displaced persons create an opportunity—to stay clean and healthy, to walk with dignity and to know that God loves them enough to inspire someone thousands of miles away to provide loving care. We thank Sheridan for the wonderful support through the years as we have been able to donate thousands of quilts and kits. Now we pray that we can reach new heights in providing even more kits and quilts. When Sheridan’s donations join those of hundreds of other Lutheran congregations across the country, millions of people who are in need throughout the world can experience God’s love and care that we send in every quilt and every kit. The items listed below are for each kit. These items are collected and assembled each October.